Apollo 11 moonwalker Buzz Aldrin speaks at the renaming ceremony for Buzz Aldrin Middle School in Montclair, New Jersey, on Sept. 16, 2016. Apollo 11 moonwalker Buzz Aldrin returned to the middle school that he attended in his hometown of Montclair, New Jersey, on Friday (Sept. 16) for a renaming ceremony in his honor. "I am just so honored to have this school, the Buzz Aldrin Middle School, named after me," said Aldrin, addressing the hundreds of students, teachers and members of the Montclair community who turned out for the outdoor dedication ceremony. "It is one of the more unique honors I have received and it is particularly warming because it is here in my hometown." Apollo 11 astronaut Buzz Aldrin displays a cookie decorated to mark the renaming of Mount Hebron Middle School in Montclair, New Jersey as Buzz Aldrin Middle School. After earning his doctorate in astronautics from the Massachusetts Institute of Technology (MIT), Aldrin was selected to be among NASA's third group of astronauts in 1963. He demonstrated the first productive spacewalk on Gemini 12 in November 1966 and then became the first to land on the moon with Apollo 11 commander Neil Armstrong on July 20, 1969. "I went to the moon and I am hoping some of you folks, if you want to, maybe spend the rest of your life — I don't know why you would want to leave Montclair — spend the rest of your life on Mars," Aldrin said at the renaming ceremony. Aldrin, who is now 86, credited the former Mount Hebron Middle School as a turning point in his life, where he gained his focus to pursue the academics that would lead to his successes later in life. "I didn't want to lag behind my two older sisters, who excelled well in their studies. I was monkeying around. Maybe I goofed off a little bit," Aldrin admitted. "When I got to the middle school, Mount Hebron Junior High, it led to a maturing and increased awareness … where I learned the fellowship of guys and the competitive spirit and desire to win." Apollo 11 moonwalker Buzz Aldrin and Ron Bolandi, Superintendent of the Montclair School Sys-tem, chat together under the new sign for the renamed Buzz Aldrin Middle School. Among those who came out to congratulate Aldrin on the renaming were Buzz Aldrin Middle School principal Jill Sack, Paul Fishman, U.S. Attorney for the District of New Jersey and Bob Caggiano, a Mount Hebron alumnus and vice president of sales at Annin Flagmakers in Roseland, New Jersey, who presented the astronaut with an American flag that flew at Omaha Beach for the 70th anniversary of the D-Day invasion of Normandy in 2014. According to some NASA accounts, Annin produced the U.S. flag that Aldrin and Armstrong planted on the moon. Montclair resident and CBS "Late Show" host Stephen Colbert also turned out to celebrate the school's rechristening. 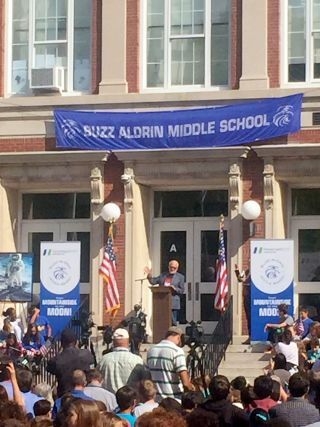 Buzz Aldrin Middle School is now the third public school to bear the Apollo 11 astronaut's name. There is also an Aldrin Elementary School in Reston, Virginia, and a Buzz Aldrin Elementary School in Schaumburg, Illinois. "But this town [Montclair] will continue to make the Buzz Aldrin Middle School the best school and make me proud," said Aldrin. The decision to rename Mount Hebron Middle School for Aldrin was made by the Montclair Board of Education in October 2015. School officials retained the school's old name by moving the original sign to the school's auditorium. Aldrin is the latest New Jersey-born astronaut to have a school named after him in the Garden State. The late Mercury astronaut Walter "Wally" Schirra, who was born in Hackensack, New Jersey, was honored with the naming of an elementary school in Old Bridge. And in May, twin astronauts Mark and Scott Kelly were honored in their hometown of West Orange when Pleasantdale Elementary School was renamed Kelly Elementary School.